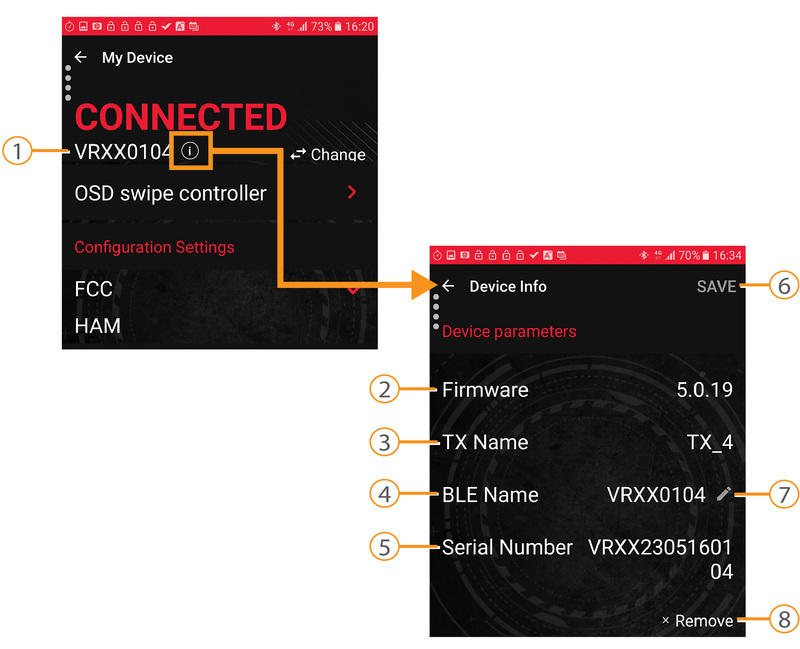 BLE Name (4) – Bluetooth Low Energy HD receiver name. Click the Edit icon (7) to edit the BLE name. Click Save (6) to save the changes and return to the main menu. Click Remove (8) to delete the device from the Paired Devices list. The name of the connected unit (1) appears at the top of the Main Menu. Display on the connected monitor or FPV goggles (see Using the OSD Swipe Controller). Configuration Settings (3) – enables selecting a regional RF mode. Frequency Settings (4) – enables selecting a frequency mode (see FrequencyManagement﻿ ). Tip: Click the Change button (5) to connect to a different unit. on the connected monitor or FPV goggles (see Navigating in OSD Menus). 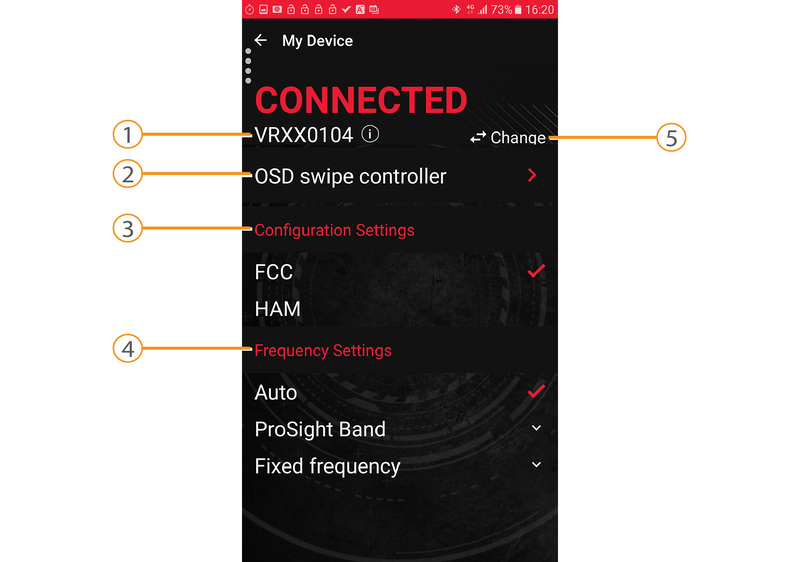 The application swipe commands replace the need to use the HD receiver control buttons (see Navigating in OSD Menus). Functions like the SEL button when in a menu. 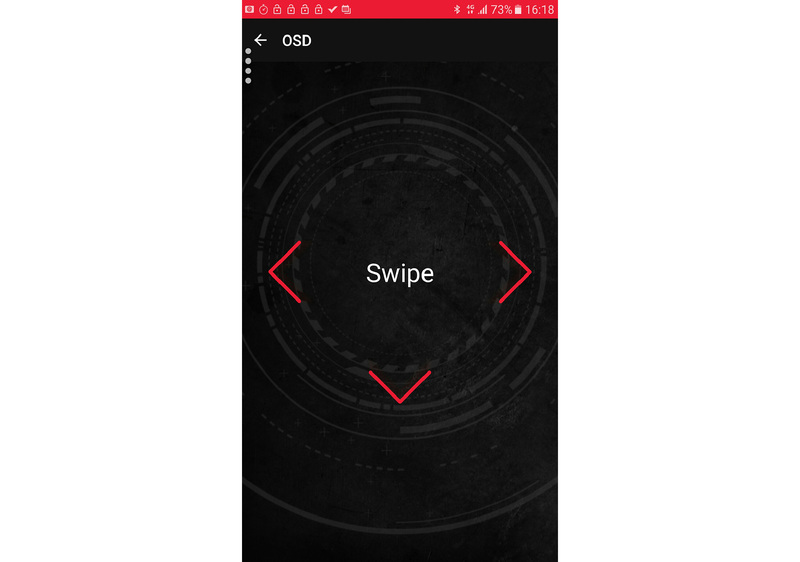 Swiping down – functions like the NEXT button: scrolls down the OSD menu. Swiping left – functions like selecting the Back option: returns to the previous screen. Auto (1) – constantly searches for the optimal frequency. ProSight Bands (2) – enables selecting a race set. Each set consists of two frequencies within the DFS spectrum. The system scans to verify that there is no interference with other devices and will switch between the two frequencies when required. Fixed frequency (3) – lists fixed frequencies for manual selection. Once a certain frequency is selected, the HD transmitter uses only the selected frequency. 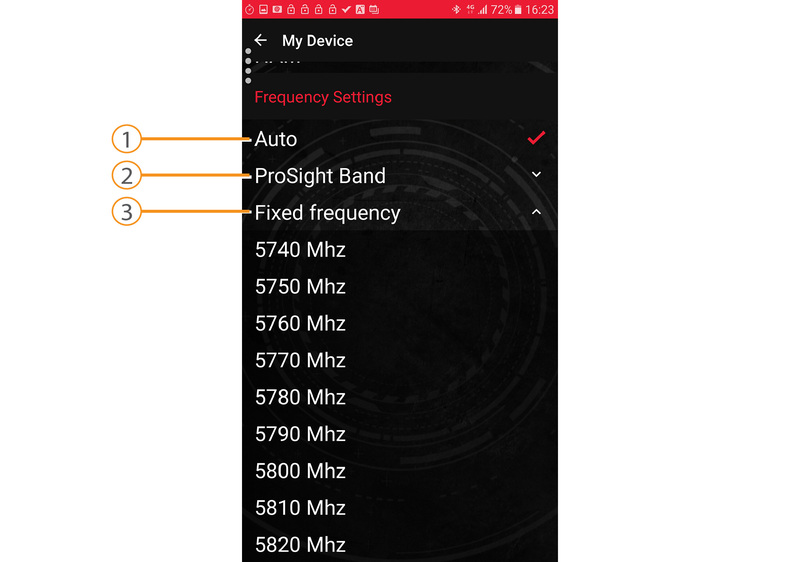 For more information on Frequency Management, see CONNEX ProSight Frequency Management.